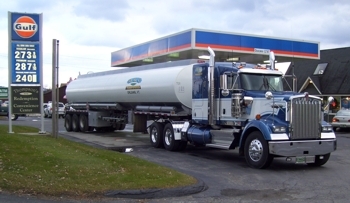 D&C Transportation is a premier wholesale fuel transport and trucking company that has been servicing New England since 1974 servicing Vermont, New Hampshire, Maine, Massachusetts, and New York. We specialize in bulk fuel delivery and transport, dump truck services, heavy equipment hauling, site development, and tank and equipment services. We serve a diverse group of customers including convenience stores and gas stations, industrial plants, and commerical retailers. Our goal is to provide our customers with on-time deliveries, competitive hauling rates, and a trustworthy team of professional drivers who have a strong safety record. For our Valero, Irving, Gulf, and Unbranded products, we sell all grades of ethanol gasoline year-round, non-ethanol gasoline from May through September, on-road and off-road diesel fuels year-round. Call or e-mail us today and give us the opportunity to create a proposal for you that is customized to your needs. We have a dedicated team of employees who take pride in their work, strive to go the extra mile, and treat all customers fairly.